Australia says a piece of debris found on a Mauritian island will be examined to see if it is part of missing Malaysia Airlines flight MH370. A hotel owner on the island who saw the debris said it bore a design and looked like it was from the inside of a plane. If confirmed, it would be the first piece of interior debris from the plane yet to be found. MH370 disappeared in March 2014 while en route from Kuala Lumpur to Beijing, carrying 239 passengers. 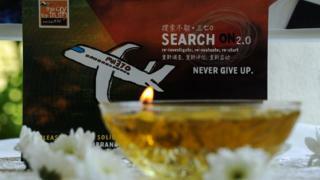 Despite an extensive deep water search, led by Australia, the plane and all its passengers remain missing. MH370 search: Does debris solve the mystery? Australian Transport Minister Darren Chester said the debris, found last week, was an "item of interest". It was discovered by hotel guests on Rodrigues Island, about 560km (350 miles) east of the main island of Mauritius. "For sure it looked like part of an aeroplane - it looks like it's from the inside part of it," said William Auguste, owner of the Mourouk Ebony hotel. "There was wallpaper inside of the plane, you can see this design and part of it is still there." Last month Australia said debris found in Mozambique was "almost certainly from MH370" and in 2015 French authorities said a wing part found on the Indian Ocean island of Reunion was part of the plane. The search has focused on the southern Indian Ocean. More than 95,000 sq km of a 120,000 sq km area has now been examined, with the remainder set to be covered by June, when the search is scheduled to end.